New Delhi: Aluminium major & Navratna CPSE National Aluminium Company Limited (NALCO) has signed MoU with the Ministry of Mines, Govt. of India, setting highest ever target of Rs 9350 crore revenue from operations for FY 2018-19 which is 15% higher than last year. The MoU was signed between Shri Anil Gopishankar Mukim, Secretary, Ministry of Mines, GoI and Dr. Tapan Kumar Chand, CMD, NALCO in New Delhi, today. Shri Mukim, Secretary, Mines complimented NALCO management for the excellent performance of the company, high standard of Corporate Governance in 2017-18 and robust business plans for 2018-19. The MoU has been formulated as per Department of Public Enterprise guidelines and finalized after discussions with both Inter-Ministerial Committee as well as Ministry of Mines.The MoU has also set a target of 2.1 million tons for production of Alumina with 100% capacity utilisation & an optimum Aluminium production target of 4.15 lakh tonnes. It sets a target of reduction in net carbon consumption as part of improvement in production efficiency, apart from giving thrust to commercialisation of new R&D products. The Company has set a challenging CAPEX target of Rs.1100 crore for the year 2018-19. The expenses will be incurred in several projects like the 1 million tonne 5th stream of Refinery, Utkal-D&E coal blocks, wind power projects, JV projects and modernization & up- gradation of plant equipments. In yet another strategic move on the human resource front, target is also set for assessment of employees through People Capability Maturity Model (PCMM) and implementation of online human resource management system. The targets will enable the company to synchronize its workforce and skill set in line with the new corporate plan. 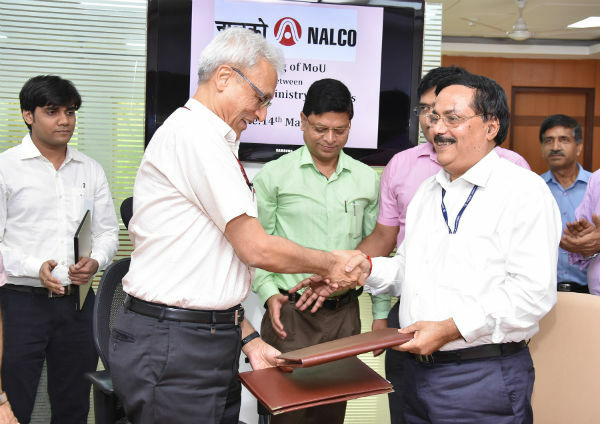 Dr. K. Rajeswara Rao, Additional Secretary, Ministry of Mines & Shri Anil Kumar Nayak, Joint Secretary, Ministry of Mines, and other senior officials of Ministry and NALCO were notably present on the occasion. Next articleSunabeda cops organised awareness drive to check the violence against women and girls.